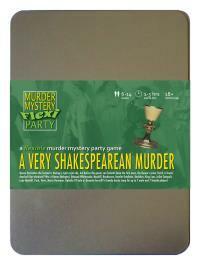 You've been invited to play the role of JULIET CATAPULT in A Very Shakespearean Murder. What scream through yonder window breaks? Queen Derivative the Second is having a right royal ado, but before the guests can forketh down the first oxen, the Queen’s jester Yorick is found dead-ed! Join us to find out who-duneth-it! The purity of your youth is reflected in your long white dress that resembles a night-dress and which is tied with an embroidered belt. Your hair is long and braided, and you occasionally squint. You are young and have your whole life ahead of you - which is why you are throwing it all away to be with the boy next door. You have become quite obsessed with Romeo Magherd - you find it quite hard to think of anything else. You can’t help it - he’s just totally to die for. I am Juliet Catapult of House Catapult. Alas, poor Yorick, I knew him not at all before tonight. Still, ’tis a tragedy that he should be so brutally killed. But let us speak not of such sad matters. I cannot be sad when I am so in love with Romeo Magherd - but don’t tell my parents! Oh Romeo, Romeo, wherefore art thou Romeo? Seriously Romeo, show yourself, are you here? I am quite short-sighted.